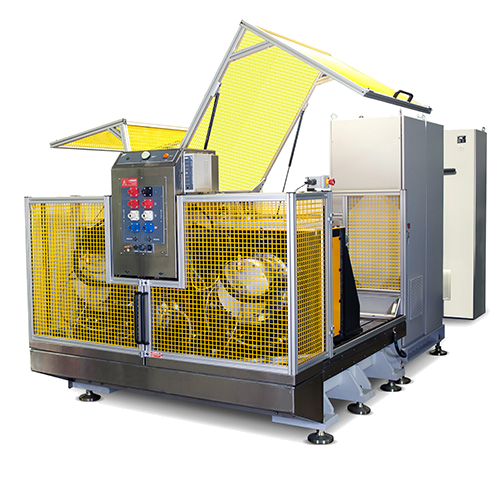 The EPT-350 is designed with two load motor systems including a pump system for customer controlled oil-cooling. The device under test inverter is tested by powering it with pre-set DC current or voltage profile and running its customer-specific control profile. Thank you for your interest in the EPT-350 Durability and Endurance Tester. Please fill out the form below so we can send you the brochure. Thank you for your interest in the EPT-350 Durability and Endurance Tester. Your request has been submitted to our sales department, and we will get back to you soon. D&V specializes in the design and integration of mechanical, electronic data acquisition systems, and software applications to produce these new test machines at the highest level of performance and technology. This laboratory test system offers simultaneous testing of integrated motor-generators and/or their controllers (variable frequency motor-drives). The EPT-350 is developed for e-motor durability testing and runs long-term drive cycles to prove out product design, component integrity and build quality. There are ancillary modules that support endurance testing which are generally supplied with an EPT-350 system. These include thermal chambers and coolant conditioning systems. The purpose of the thermal chamber is to cycle the device under test e-motor with temperature and humidity changes throughout its testing period. During the lengthy test, the EPT-350 data acquisition system is able to measure and record all necessary data for test article evaluation.